I'm on a trajectory to do my very first autocross on Sunday. Do people with PDK/Sport Chrono typically launch? Does it depend on how close the first corner is? I did my first launches today, to familiarize myself. I am in manual mode. The first couple of times I was really surprised how fast the car got up to red line, and my shifts into second were quite rough. I think I was freaking a little, and let up on the accelerator as I saw red line approaching, and that created the rough shift. Because on my last attempt, I made sure to keep it floored, and just clicked off the shift, and it was just fine. It certainly seems faster than moving your foot from the brake to the accelerator - but maybe too fast if there is a corner soon after the start. What can the autocross veterans tell me? When doing a launch i always shift at 6500 cause i dont like that the care looses a bit of power above 6500rpm. I dont know if it makes the car go faster then to let the pdk handle it with redline shifts. If the first curve are really close you just shift early in to second or what gear thats the best. One thing that you really should practise is left foot braking! First it can feel odd and you will brake to much or to little but when you get the hang of it you gonna save alot of time. When i started to practise it i did it on my daily driving and now years after i never use my right foot for braking. Depending on the layout it can be faster to coast, trail brake or floor it in the curves. If your car has PTV it opens up a bit more for agressive driving. If this is your first autocross, I'd worry more about smoothness and overall strategy. Just get comfortable with the car and the process. Your first event is part of a longer learning process. If you feel slightly out-of-control at the start (due to a sudden launch), it could be tough to settle down for the rest of the run. A moderately fast start will be fine and allow you to "take in" more about the overall course. For example, some larger autocross courses will allow you to "apex" the various turns. 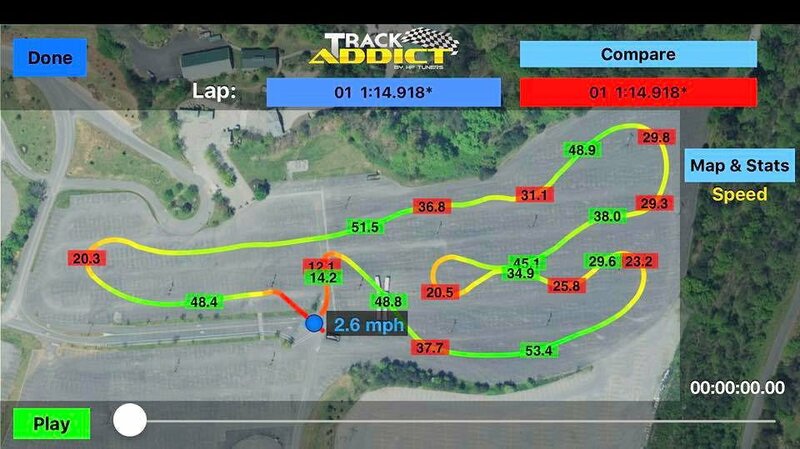 But if you run a course laid out in a smaller parking lot, it may be best to simply take the path of shortest distance rather than worry about an ideal apex location. It'll be easier to figure this out if you don't focus too much on having a balls-out start. You should also spend a little time playing around with steering wheel position and seat angle/position. Some drivers like to sit close to the wheel with elbows bent, NASCAR-style, in order to "muscle" the car around. Other (like me) prefer arms more straight with the seat pushed back. You'll also need to figure out braking points and turn-in points, especially if it's a faster course. Back in the 70s, I used to run autocross events that involved starts on aircraft runways. Some of these events allowed you to get up to about 100 mph before the first turn. So in those high-speed autocrosses, a wicked-fast launch was important (and also impossible in the 42 HP Bugeye Sprite I was using ). In shorter courses, I've seen people spin-out at the start because they were too focused on raw acceleration. If you are able to record times and mount a video camera (your phone would be fine if it is in a sturdy mount), it can help in self-critique and improvement. Eventually you will want to be able to maintain a pace where you are "almost never coasting" (almost always accelerating hard or braking hard). But this is a learning process and no one is fast at first. johan, bergmanmark and jimmuller like this. I am worried more about smoothness and overall strategy. What I'm most worried about is hitting a cone. I intend to be consistently slow and conservative enough to avoid this. I was curious about other peoples' starting techniques. Is it possible to tell which direction this course goes? I'd like to read more here, especially about the launch. The simple reason is that though I used to run autocrosses regularly in the old days I've never done so in a car with automatic transmission, nor one with as much power as my Cayman. At this time I have no specific plans to run one but may do so this summer. Way back then (like 40 years ago) I had won 1st in class ("B stock" IIRC, driving an X-1/9) three times in a row at our local club's events. Then I moved away to attend grad school and the autocrossing stopped. About 15 years later VTR held it national convention nearby so we drove our Spitfire and I ran the autocross. Took 2nd in class, missed 1st by 1msec, so I guess I didn't lose too much during the layoff. Back then the launch was just rev, release the clutch softly, shift to 2nd, and stay there. But running the Cayman will be a new experience. I don't think I'd want to run any course where I could reach 100mph before the first turn. Well, not without several chances to practice it first. Running that fast isn't something I get to do on public streets, let alone brake hard for an upcoming turn on an unknown road surface! One piece of advice I used to give people back then was about picking the best line. So many people, even more commonly on the street than on an autocross lot, think only in terms of where they want to go for the next pylon or next turn. Less intuitive perhaps but more important is which direction you want to be going when you get there. Taken a step further, you could include having an idea of which way the car is pointing when you get there, which is not necessarily the same as the direction you are going. Now about launching the PDK without Launch Control... With traction control on or off? How does one avoid trashing the clutches? Car mags don't have to worry about trashing their test cars. Last edited by jimmuller; 03-23-2019 at 11:23 AM. It was my intention, and assumption that it would be best, to have PSM fully on (the default). What exactly is "launching the PDK without Launch Control", and how does it apply here? I'm confused. Before doing a launch press the PSM button once and a notification pops up telling you that PSM Sport is engage. If you do not press the PSM button there is a big risk for toasting the clutch!! In PSM Sport a certain amount of wheel spin is Ok, with PSM in normal mode No wheel spin is Ok and all the spinning will be done in the clutch. When the car mags used to measure 0-60 or 1/4 mile times with an automatic they would hold down the brake while rev'ing the engine, then release the brake. I always wondered how often you could do that before the transmission needed rebuilding. But back to autocrosing, one could do that, or one could just mash the accelerator and stare out the window for the engine to reach 2000rpm before the real torque cuts in. I'm just curious what people do these days, or what they ever did. i am guessing clockwise and the start is the big blue dot. you can see a car lined up and ready to hit the course and he will be going to the left side of the screen first. hmmm. maybe the car options make things different? i have pdk, sport chrono and every other performance option aside from PCCB. when i want to launch i was told to go to sport+ on the dial, left foot on the brake, right foot on the gas, wait for the screen to tell me to go, release brake. that's how i've launched every time and haven't had any issues, and hoping i won't! Last edited by johan; 03-23-2019 at 06:02 PM.